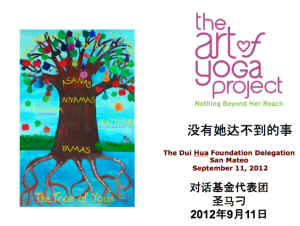 Last month The Art of Yoga Project (AYP) participated in the 2012 Juvenile Justice Expert Exchange between three Bay Area County Juvenile Justice systems and delegates from China’s Supreme People’s Court. From September 9-16, seven Chinese juvenile judges visited three jurisdictions: San Mateo, San Francisco and Santa Clara – all service areas for AYP. The judges were interested in the collaborative approach between probation officers, courts, attorneys, mental health and community-based organizations like The Art of Yoga Project. AYP was asked to participate in a multi-disciplinary gender-specific treatment overview in San Mateo. Sarah Barnard, Site Director for San Mateo and San Francisco, presented our gender-responsive, trauma-informed model and eight best practices for the rehabilitation of teen girls in the juvenile system.